Life has been so busy lately with a ton of commitments, events and travelling. I was feeling overwhelmed lately and a little bummed about over committing myself and not having time to smell the roses. I’ve found myself getting into a pattern of doing more venting at home than I was happy about and my Main Taste Tester and I decided we are going to talk about things we appreciated about each day to replace the venting. I’m excited about changing my language for the better and think it will bring a lot more positive into life. I got lots of good mail this week. A birthday card (filled with confetti!) from a friend in the States, a couple of wedding invitations and some packages. Good mail always perks me up. I went home this past weekend for my 4 year old cousin’s birthday. We went bowling and had a family barbecue. I made her a chocolate Hello Kitty cake (her request) and she was pretty excited about it. We had such a fun day. We went out on Saturday night to watch one of my cousin’s bands perform. The place was packed and my grandma stayed out with us until 1 a.m.! We had a blast and it was fun to do something different with her. My dad gave me a belated birthday gift this week of an awesome infuser jug. It has a compartment in the middle for loose tea and fruits. I have been wanting one to make infused water (and sangria, if we’re being really honest), and it also makes hot or iced steeped tea. It was a really thoughtful gift and I’m going to use it a ton. 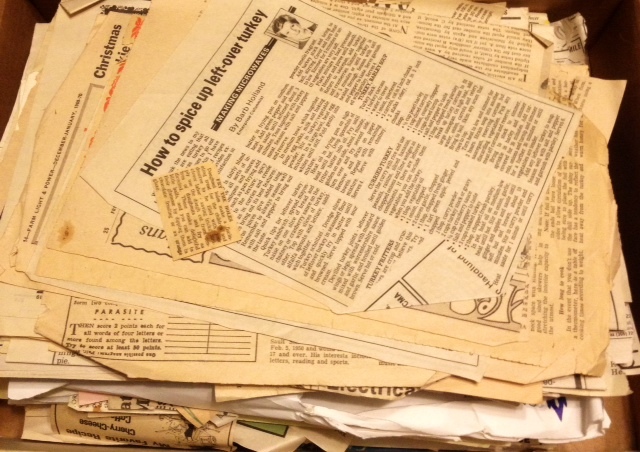 My maternal grandma surprised me with an old box full of recipe clippings from old (and I mean old) newspapers. She had gotten them from my great grandma’s house and knew I would put them to good use. I love the thought of making recipes my great grandma used to make. My paternal grandpa has been sick on and off for a while with complications from cancer. His condition landed him in the hospital last week and we were able to visit him there. Although he is not well, I know it brightened his spirits to spend some time with us and we treasure every minute with him. He is an amazing grandpa, the same one in fact who inspired my blog name. Please keep him in your prayers.